Promoting a better planet through commitment to wildlife conservation and the exploration of the human-animal connection. Support the California Gray Whale Depletion Petition by December 8! Recent numbers of mother-calf pairs are the lowest in years, due to a myriad of threats including climate change, lack of food, sonar testing, boat strikes and many other hazards these fabulous creatures must negotiate during their long annual migration. The California Gray Whale Coalition has submitted an important petition to the NMFS on October 21, to upgrade the whales to "depleted status" under the Marine Mammal Protection Act. Your action right now to sign the petition requests that the National Marine Fisheries Service issue a positive 60 day finding on the petition in order to initiate a formal status review of the population. A suggested draft, provided by the California Gray Whale Coalition follows. Comments supporting the depleted petition filed by the California Gray Whale Coalition need to be submitted by December 8, 2010. I (enter your name here) submit the Eastern North Pacific Gray Whale population is below its optimum sustainable population and that the petition provides compelling evidence of inhibited reproduction, diminished prey availability and increased predation, which are severely impacting the viability of the population. Ever heard of a firefox? How about a red panda? If not, don't worry. Most people haven't! But there is an adorable little raccoon-like mammal that dwells in the high-altitude forests of the Eastern Himalayas in Nepal, as well as in northeastern India, Bhutan and parts of China and northern Myanmar. Its habitat is shrinking due to deforestation and the spread of agriculture as well as several other factors, including poaching. Red Panda Trapped at Mabu. Photo credit: Sonam Lama. What's cool is that the Red Panda Network, a nonprofit devoted to protecting the red panda and its habitat, is working with "forest guardians" who prevent further destruction by mobilizing their local communities to take control of their forests. Recently, forest guardians in China and Nepal discovered two red panda trapped in cages and waiting to be sold at a restaurant and a pet store. Thanks to the monitoring activities paid for by Red Panda Network, these little cuties were returned to their natural habitat without being harmed. In order to increase global awareness of the red panda and its unique challenge for survival, Red Panda Network has initiated International Red Panda Day, a global awareness campaign and celebration of this little-known species. If you would like to support the cause, you can adopt a red panda via the Red Panda Network website. Contributions received from International Red Panda Day will fund awareness campaigns in Nepal and China where the two red panda were recently found for sale. Protesters near a Japanese Consulate, October 16, 2010. Thousands of animal advocates flocked to Japanese Embassy and Consulate offices around the world on October 14, in a rousing display of human compassion and empathy for Taiji dolphins. The Social Action Campaign for The Cove has created global awareness of the brutal annual slaughter of more than 20,000 dolphins and porpoises off the coast of Japan, in the village of Taiji. The campaign has also exposed the practice of selling Taiji dolphin meat, which contains toxic levels of mercury, to Japanese consumers. 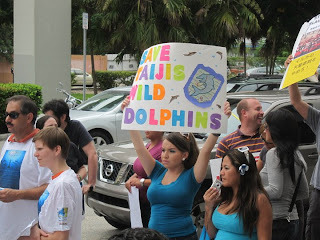 The thousands of people who peacefully demonstrated on behalf of dolphins showed up in Miami, Los Angeles, Boston, Phoenix, Philadelphia, Seattle, San Francisco, Detroit, Atlanta, New York, Honolulu, London, Toronto, Ottawa, Dublin, Cape Town, Isreal, Jakarta,Vienna, Melbourne, the Philippines and Hong Kong, as well as many other cities worldwide. Considering the covert nature of the original investigation into the Taiji dolphin slaughter, it is an amazing testimony to the power of social networking that thousands of people all over the world are now demonstrating on behalf of dolphins who swim the waters near a tiny, remote village in Japan. What are you passionate about? Whatever it is, start now. The world awaits your call to action. Six Japanese Theatres to Show "The Cove"
Freedom of speech made progress in Japan this week as six theaters stood their ground and agreed to start showing "The Cove" movie beginning July 3. Several cetacean species stand to benefit from a rise in public awareness about dolphin slaughter in Japan's village of Taiji: more than 20,000 bottlenose dolphins, pilot whales, porpoises and Risso's dolphins are routinely slaughtered for meat and sold to the Japanese public or captured for use in aquariums. Ric O'Barry, who trained dolphins for the television series 'Flipper," is campaign director for Save Japan Dolphins, featured in the film. He and his team of activists have been at this for years and are making great progress, but they still need our help. According to O'Barry, most of the Japanese public isn't aware of the brutal slaughter in Taiji. Would you like to be part of the wave that helps this campaign reach the tipping point? If so, please sign the letter below! 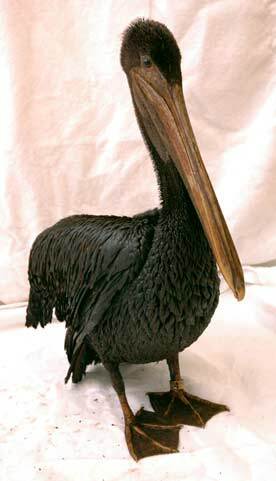 June 22 was Day 63 of the Gulf of Mexico oil spill and the wildlife death toll that has been recorded is: 957 birds; 387 sea turtles; 47 marine mammals. Obviously these are only the numbers that the NOAA and the wildlife rescue organizations in the gulf have managed to record. Countless other species up and down the food chain have been decimated. I'm all for a balanced work/life ethic, but President Obama spent the weekend golfing and BP CEO Tony Hayward, staying true to his earlier comment about wanting his "life back," spent the weekend yachting in British waters. Perhaps even the CEO of BP deserves a day off, but to publicly engage in a water sports activity truly shrieks "I don't CARE" from across the channel, no? Talk about adding insult to injury! In any case, it was a clear demonstration of either his insensitivity or his indifference to the magnitude of suffering by the oil spill victims: humans and animals alike. 1) Text "NWF" to 20222 to donate $10 to the National Wildlife Federation. 2) Call 1-866-404-5826 to donate to the United Way Gulf Recovery Fund, which provides emergency assistance, including food, rent and utilities now. 3) Text COAST to 50555 to donate $10 to the Nature Conservancy. We've all felt helpless at one point or another and there's no end in sight. Let's stick together and take action. Let's vow not to be helpless. Let's stop looking up the ladder of command for answers. We can be the solution in numbers. New dirt on BP: it's more like 60,000 barrels per day. Not five. So sue me. No, sue BP. Wait! We don't want to boycott them or sue them, else how are they going to pay for the massive cleanup that should take the next four decades? Wow. What a sticky mess. Sticking to the mission of this blog, let's focus on the positive and celebrate the organizations that are performing holy work to save wildlife, one creature at a time. I've got a soft spot for the International Bird Rescue Research Center (IBRRC) because their work is so painstaking - it can take more than one hour to clean just one bird. Jay Holcomb, IBRRC's executive director, is leading the center's rescue work in the gulf and was recently named Oceana's Ocean Hero for 2010. Oceana, an international organization focused solely on ocean conservation, created the contest in 2009 to recognize individuals making a difference for the ocean and winners are announced on World Oceans Day. Bless your heart, Jay. Thanks for providing a beacon of hope during this horrific crisis. We salute you! OK. 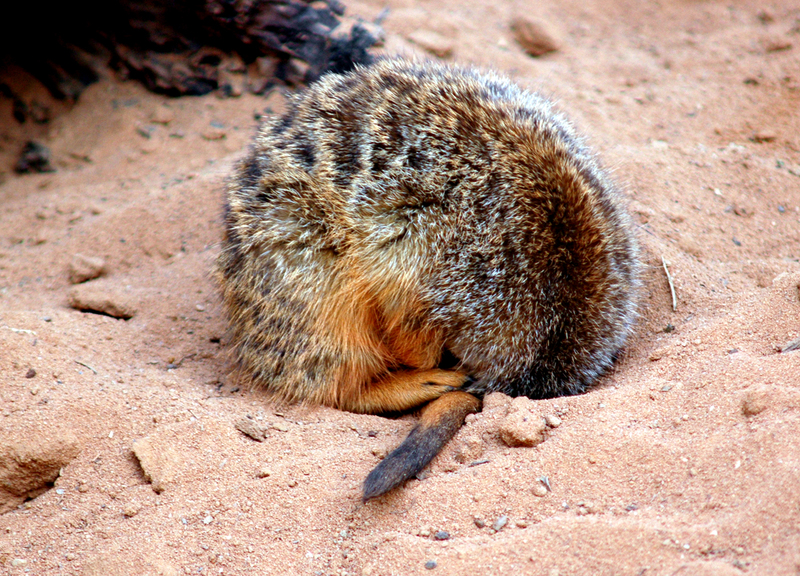 I straight up admit it: I've buried my head in the sand. Yep. I am a self-proclaimed broken-hearted whimp and I just can't bear hearing and seeing the details of the damage done by the BP oil spill. I know that's unacceptable if you have journalistic aspirations, but I've drawn the humanity card and I'm only just now beginning to watch the news and look at all the images. I'm confused about the government's response to the oil spill. I'm also perplexed by the way BP handles (or doesn't handle) the media, though in some ways I also find it reassuring: "Sorry Anderson, we're busy plugging a hole at the moment. We'll have to get back to you." Maybe it's just that simple. More likely, BP knows and has known from the beginning just how grave the magnitude of this event is and decided early on that to say anything would be to unleash total mayhem. Let the locals and then the world digest this mess one tragic day at a time. I do feel for the local fisherman and their families. And what about the BP employees who lost their lives? It's kind of sad how little we've heard about them throughout this disaster. Meanwhile, the wildlife disaster unravels before our eyes and the fact that it's spawning season makes the situation even worse. So. What is being done to help the various species? Which organizations are involved? And most importantly, what can we do to help? After denial, comes action. I speak for myself, so forgive me if you already jumped in weeks ago! Let's start with the birds. 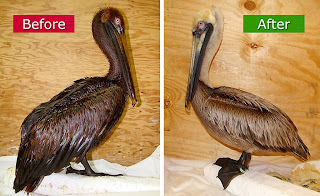 Tri-state Bird Rescue and Research is leading the wildlife rescue efforts in the gulf, along with the International Bird Rescue Research Center (IBRRC), the Louisiana State Animal Rescue Team (LSART) and the U.S. Fish and Wildlife Service (USFWS). Want to volunteer? You can register to help out with the oil spill recovery! The Louisiana Gulf Response volunteer program will contact you based on their needs. Want to make a contribution? 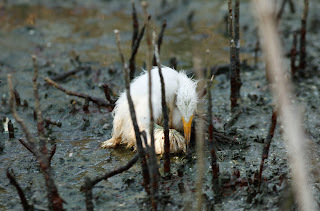 Donate whatever you can now for the oil spill recovery effort. So... the oil spill. Having just completed an article about marine debris, with the leading culprit as plastic, I've remained inexplicably silent about the 5,000 gallons of crude oil that have been pumping into the Gulf of Mexico for the past 30 days and counting. What this disaster means to Gulf of Mexico wildlife and the environment can best be explained by photos, rather than words. 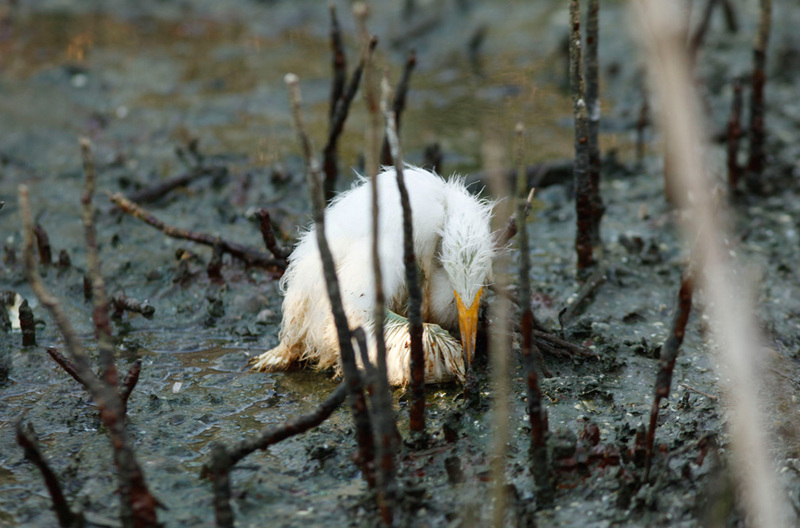 The Boston Globe published a series of photos today and sliding through them, I was struck by this one of a young heron, crumpled in a soggy heap, surrounded by oil where oil should never ever be. The first thought that struck me when I heard about "the spill" was that we've left the keys to the planet on the kitchen counter and the teenagers made off with them. I dunno. Call me naive, ignorant, whatever you want. If we can't guarantee that disaster of this level will not happen, then we shouldn't be drilling at all. I mean, here I was, obsessing with Andie MacDowell about all of our garbage and trying to shed some more light on the Great Pacific Garbage Patch and now this. Now all I can picture is a horrifying Sci Fi film where Patch meets Spill. Wait a minute...polypropylene absorbs oil! This could be a match made in heaven! 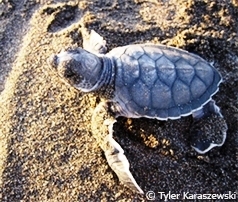 For information about the impact of the oil spill on marine mammals and sea turtles, visit the NOAA website for daily updates. To donate $10 to support Gulf wildlife now, Text "WILDLIFE" to 20222. 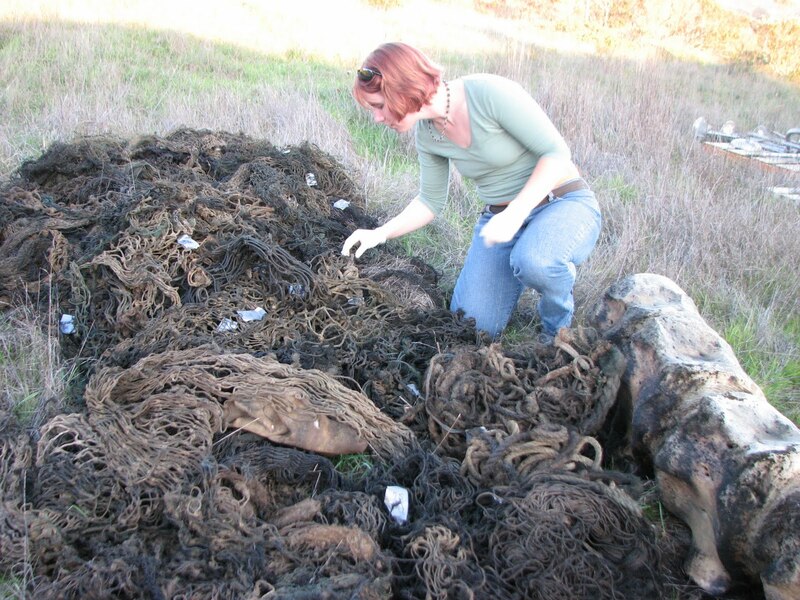 Marine Debris Starts with You and Me? The muse for my second article in CoastViews Magazine is none other than a California Sea Lion by the name of Abagnale. He was spotted by tourists on January 1 at Pier 39. It took the Marine Mammal Center Rescue Team three weeks and twenty rescue attempts to catch this animal, which is why they named him after the infamous Frank Abagnale, Jr., a 1960's con artist who always seemed to be two steps ahead of the authorities. Abagnale was entangled in monofilament nylon fishing line, which was wrapped not only around his neck, but around his muzzle. He couldn't even open his mouth to eat. Abagnale's story has a happy ending. The Marine Mammal Center finally caught up with him at Moss Landing, about 15 miles north of Monterey. His rescue was intense, with crew both in the water and on land, but their efforts finally paid off. Using darts with a mild sedative, the team rescued Abagnale on January 24th and took him to the Center, where he stayed for about 13 days, while he received top-notch medical care for his wounds and snarfed 100 pounds of herring. He was released on February 4th and has since been spotted at Moss Landing, looking good. Years ago, I read about birds getting entangled in six-pack rings, and I couldn't bear the idea that our trash was impacting wildlife. But in fact, the six-pack rings are just the tip of the iceberg. Fishing line, fishing net, plastic bags and all types of cellophane and plastic are a growing problem for marine mammals and birds, who frequently mistake plastic for food and feed it to their young. We have so much to think about. How do we recycle properly? How much of the plastic we recycle actually gets recycled? What happens to the rest of it? What do those numbers inside the triangle on plastic "recyclables" actually mean? How does our garbage end up in the ocean? What about the trash that washes up on our beaches? How does this relate to the giant Pacific Garbage Patch? How does this affect marine life? And what is being done to stop more trash from flowing into the ocean? Which organizations are watching out for wildlife and making a difference? More on this topic later. Must sleep. Still Hissing After All These Years! Meet Gigi. She's a rescue who was feral when I got her in 2004 and after six years of "working with her," she still hisses at me as I hand her a dish of food. Some of my friends can't believe I enjoy having a pet like Gigi, but I find it hilarious that she hisses at the hand that feeds her. How very feline! 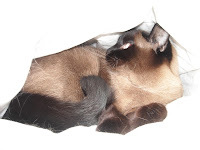 I have always been partial to animals with special needs and I like having a wild animal in the house. She lumbers out from under the bed, where she spends most of the night and half the day, and races for the living room sofa where I'm sure to keep a nice big blanket waiting, so she can dive bomb under that and hide some more. She makes strange warbling sounds like a tree animal and never looks me in the eye. She is also the best snuggler of any cat I've ever met. Whenever I have trouble sleeping, all I have to do is pick her up and hold her for a few minutes and we both fall asleep instantly! I'm very clear that she was not put here to entertain me. We cohabitate. And when she hisses and disses the hand that feeds her, I never take it personally. I'm a freelance writer/editor whose passion for Mother Nature and wildlife conservation has grown in direct correlation to the global digital revolution. I hope to inspire action on behalf of threatened species, but also celebrate the great work that humans and animals achieve together to improve life on earth. Mike Makes it Home! "Hey Mikey ~ He Likes It!"